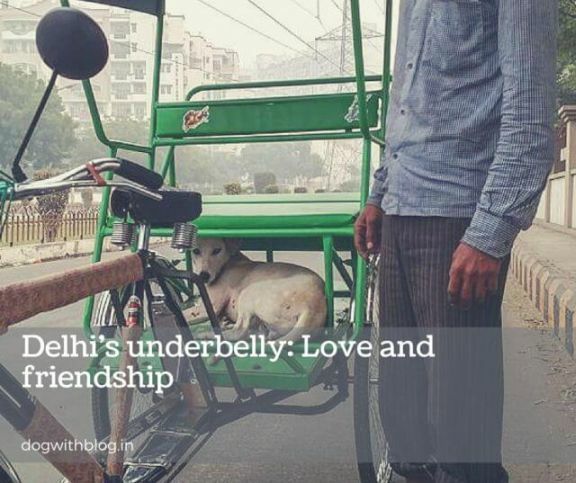 You need to know these wonderful Delhi dogs! Last weekend, National Geographic Channel India gave Dog with Blog a cool opportunity to explore Delhi dogs through a roving dog’s eyes. During the course of an otherwise foggy noon in the capital, I explored the lanes and their legends, to come across heartwarming tales of dogs and their men. Nothing makes a heart any warmer than to come across kindness. Excited to undertake @inNatGeo's awesome #ExplorerChallenge where I'll be exploring the different ways in which Delhi cares for dogs! We began with Hazel’s adoption update. We are still looking for a home for her, anyone? Mallika introduced us to Bhondu, a street dog being taken care of by a kind rickshaw puller. It seems that the dog accompanies them everywhere they go. If a passenger is riding, the dog walks by their side and if there is no passenger he sits beneath the seat. I could not stop myself from stopping to quickly chat with the rickshaw puller to understand the whole deal between them. I learnt from him that Bhondu was orphaned at a very young age due to his mother’s untimely death. He has been hand raised by the rickshaw puller (in all the excitement, I missed asking his name) since he was a puppy. He is extremely well fed and has grown up to be a handsome dog all courtesy the care and compassion shown by this noble man. As I stopped to chat with Bhondu”s owner, he was quick to get down from the rickshaw to come close to me to understand what was transpiring between us. He was gentle yet alert and certainly very protective of his pet parent. Proves all over again that all you need is loving heart to accept and care for our very own Indian dogs. Behind the Saket malls, lurking in a quite road, I came across Pyaarelal ji’s tea stall. Sona the Indian pup frolics around the shop with great enthusiasm and is a known acquaintance to all the customers. Well fed and vaccinated, this dog is in good hands. One of my favorite winter sights in Delhi is to see stray dogs with jackets. So many unsung heroes work towards it, here’s thanking them all! Towards the satellite start-up city, Gurgaon, and we came across the mother-daughter duo of Gurmeet and Ishleen who take care of the stray dogs w.r.t food and veterinary needs – sterilization, vaccination and de-worming drives, and as and when need be, push for adoptions, search for suitable homes and screen potential adopters. Currently, they’re covering one block in Nirvana and some parts of Cyber City. The tales of Humans of this great city are waiting to be told. In case you know of such kind-hearts around you, please let us know. I’d like to thank National Geographic Channel India and Mission Explorer for letting me be a part of this initiative. If this sounds like something you would like to do, and possibly win a chance to go to Machu Picchu, then check out the Mission Explorer website – If you’re passionate about exploring food, art, culture, travel (or anything else, really!) in your city, you will fit the bill.